Algebraic notation exists in various forms and languages and is based on a system developed by Philipp Stamma. Stamma used the modern names of the squares, but he used p for pawn moves and the original file of a piece (a through h) instead of the initial letter of the piece name. This article describes standard algebraic notation (SAN) required by FIDE. Each piece type (other than pawns) is identified by an uppercase letter. English-speaking players use the letters K for king, Q for queen, R for rook, B for bishop, and N for knight (since K is already used). S (from the German Springer) was also used for the knight in the early days of algebraic notation and is still used in some chess problems (where N stands for the nightrider, a popular fairy chess piece). Players who speak other languages may employ different letters, for example, French-speaking players use F for bishop (from fou). In chess literature, especially that intended for an international audience, the language-specific letters are often replaced by universal icons for the pieces, for example, Nf3 is represented as ♘f3. This style is known as figurine algebraic notation. Each move of a piece is indicated by the piece's uppercase letter, plus the coordinate of the destination square. For example, Be5 (move a bishop to e5), Nf3 (move a knight to f3). For pawn moves, a letter indicating pawn is not used, only the destination square is given. For example, c5 (move a pawn to c5). When a piece makes a capture, an "x" is inserted immediately before the destination square. For example, Bxe5 (bishop captures the piece on e5). When a pawn makes a capture, the file from which the pawn departed is used to identify the pawn. For example, exd5 (pawn on the e-file captures the piece on d5). A colon (:) is sometimes used instead of "x", either in the same place the "x" would go (B:e5) or at the end (Be5:). En passant captures are indicated by specifying the capturing pawn's file of departure, the "x", the destination square (not the square of the captured pawn), and (optionally) the suffix "e.p." indicating the capture was en passant. For example, exd6e.p. Some texts, such as the Encyclopaedia of Chess Openings, omit any indication that a capture has been made. (For example, Be5 instead of Bxe5; ed6 instead of exd6 or exd6e.p.) When it is unambiguous to do so, a pawn capture is sometimes described by specifying only the files involved (exd or ed). These shortened forms are sometimes called minimal or abbreviated algebraic notation. both the file and rank (if neither alone is sufficient to identify the piece—which occurs only in rare cases where one or more pawns have promoted, resulting in a player having three or more identical pieces able to reach the same square). For example, in the diagram, Bb8 would be ambiguous, as either of the bishops on a7 and d6 could legally move to b8. The move of the d6 bishop is therefore specified as Bdb8, indicating that it was the bishop on the d file which moved. Although they could also be differentiated by their ranks, the file letter takes precedence. For the black rooks both on the 8th rank, both could potentially move to f8, so the move of the d8 rook to f8 is disambiguated as Rdf8. For the white rooks both on the a file which could both move to a3, it is necessary to provide the rank of the moving piece, i.e. R1a3. In the case of the white queen on h4 moving to e1, neither the rank nor file alone are sufficient to disambiguate from the other white queens. As such, this move is written Qh4e1. As above, an "x" can be inserted to indicate a capture, for example if the final case were a capture it would be written Qh4xe1. When a pawn moves to the last rank and promotes, the piece promoted to is indicated at the end of the move notation, for example: e8Q (promoting to queen). Sometimes an equals sign or parentheses are used: e8=Q or e8(Q), but neither format is a FIDE standard. In Portable Game Notation (PGN), pawn promotion is always indicated using the equals sign format (e8=Q). In older books, pawn promotions can be found using a forward slash: e8/Q. In FIDE Laws of Chess, an equals sign with parentheses, "(=)", is used to write the offer of a draw on the score sheet next to a move, but this is not part of algebraic notation. Castling is indicated by the special notations 0-0 (for kingside castling) and 0-0-0 (queenside castling). While the FIDE Handbook, appendix C.13 uses the digit zero (0-0 and 0-0-0), PGN requires the uppercase letter O (O-O and O-O-O). A move that places the opponent's king in check usually has the symbol "+" appended. Alternatively, sometimes a dagger (†) or the abbreviation "ch" is used. Double check is commonly indicated the same as check, but is sometimes represented specially as "dbl ch", or in older books as "++". Some publications indicate a discovered check with an abbreviation such as "dis ch". The Encyclopedia of Chess Openings omits any indication of check. Checkmate at the completion of moves can be represented by the symbol "# ". (Some use "++" instead, but the USCF recommends "# ".) The word mate is commonly used instead. Occasionally the double dagger (‡) is seen. A checkmate is represented by "≠" (the not equal sign) in the macOS chess application. In Russia and ex-USSR, where captures are indicated by ":", checkmate can also be represented by "X", "x", or "×". The notation 1–0 at the completion of moves indicates that White won, 0–1 indicates that Black won, and ½–½ indicates a draw. Often there is no indication regarding how a player won or lost (other than checkmate, see above), so simply 1–0 or 0–1 may be written to show that one player resigned or lost due to time control. (Similarly, there is more than one way for a game to end in a draw.) Sometimes direct information is given by the words "White resigns" or "Black resigns", but this is not considered part of the notation, rather a return to the surrounding narrative text. A game or series of moves is generally written in one of two ways. White attacks the black e-pawn. Black defends and develops simultaneously. White plays the Ruy Lopez. Descriptive notation was usual in the Middle Ages in Europe. However, a form of algebraic chess notation, that seems to have been borrowed from Muslim chess, appeared in Europe in a 12th-century manuscript, referred to as MS. Paris Fr. 1173 (PP.). The files run from a to h, just as they do in the current standard algebraic notation. The ranks, however, are also designated by letters, with the exception of the 8th rank which is distinct because it has no letter. The ranks are lettered in reverse – from the 7th to the 1st: k, l, m, n, o, p, q. 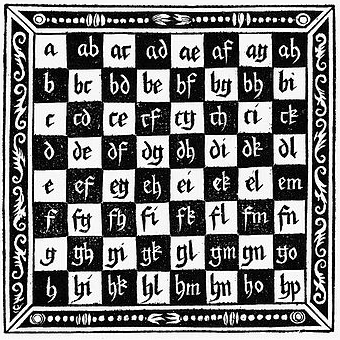 Another system of notation using only letters appears in a book of Mediaeval chess, Rechenmeister Jacob Köbel's Schachzabel Spiel of 1520. Algebraic notation is described in 1847 by Howard Staunton in his book The Chess-Player's Handbook. Staunton credits the idea to German authors, and in particular to "Alexandre, Jaenisch and the 'Handbuch.'" The table contains names for all the pieces as well as the words for chess, check, and checkmate in several languages. NB: alfil is a chess-specific loanword from Arabic which has lost its original meaning of "elephant" in the European languages that use it for the piece called bishop in English. Besides the FIDE standard (or short) algebraic notation (SAN) already described, several similar systems are in use for their own particular advantages. This section contains chess piece figurines. Without proper rendering support, you may see question marks, boxes, or other symbols. Figurine algebraic notation (or FAN) is a widely used variation of algebraic notation which substitutes a piece symbol for the letter representing a piece, for example: ♞c6 in place of Nc6. 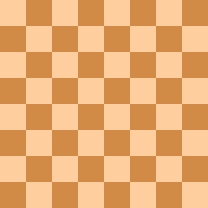 (Pawns are unlabeled, just like in regular algebraic notation.) This enables moves to be read independent of language. The Unicode Miscellaneous Symbols set includes all the symbols necessary for FAN. In order to display or print these symbols, one has to have one or more fonts with good Unicode support installed on the computer, that the Web page, or word processor document, etc., uses. Some computer programs (and people) use a variant of algebraic chess notation termed long algebraic notation or fully expanded algebraic notation. In long algebraic notation, moves specify both the starting and ending squares separated by a hyphen, for example: e2-e4 or Nb1-c3. Captures are still indicated using "x": Rd3xd7. The long notation takes more space and thus is not as commonly used. However, it has the advantage of clarity, particularly for less-skilled players or players learning the game. Some books using primarily short algebraic notation use the long notation instead of the disambiguation forms described earlier. 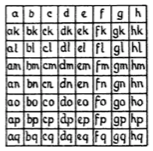 A form of long algebraic notation (without hyphens) is also notably used by the Universal Chess Interface (UCI) standard, which is a common way for graphical chess programs to communicate with chess engines (e.g. for AI). In international correspondence chess the use of algebraic notation may cause confusion, since different languages employ different names (and therefore different letters) for the pieces; hence the standard for transmitting moves in this form of chess is ICCF numeric notation. In recent years, the majority of correspondence games have been played on on-line servers rather than by email or post, leading to a decline in the use of ICCF numeric notation. 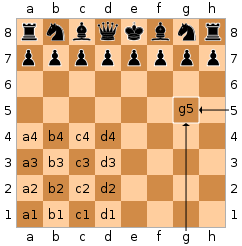 Chess games are often stored in computer files using Portable Game Notation (PGN), which uses algebraic chess notation as well as additional markings to codify a game. As mentioned, PGN requires uppercase letter O to represent castling (e.g. O-O), while the FIDE Handbook uses digit zero (0-0). ^ Davidson, Henry (1981). A Short History of Chess. David McKay. pp. 152–153. ISBN 978-0679145509. ^ Schiller, Eric (2003). Official Rules of Chess (2nd ed.). Cardoza. p. 25. ISBN 978-1580420921. ^ Sources for this section include Wikipedia articles in various languages. Note that the symbol for pawn is not used in algebraic notation. Archived 2009-10-25. ^ The Estonian chess terms were coined by Ado Grenzstein. Look up algebraic notation or Appendix:Algebraic notation in Wiktionary, the free dictionary.